AMANDA XULU writes from Rhodes University in the Eastern Cape where she says students seem apathetic about this yearâ€™s election. In recent history, Rhodes University has not been known for its strong political opinions about issues that are seen as important around the rest of the country. The only protest worth mentioning is the Water Protest, which took place towards the end of last year, after Rhodes students had gone without water for almost two weeks. 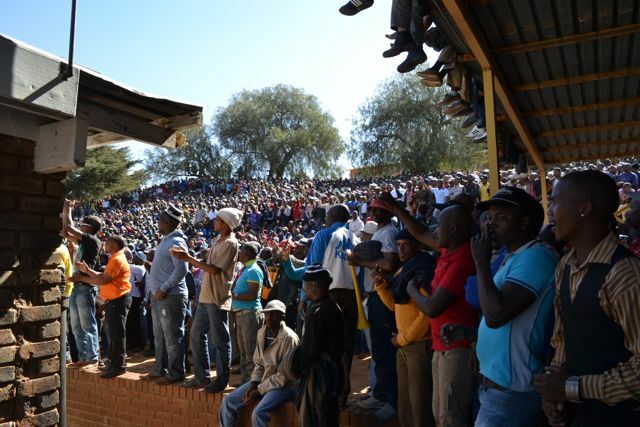 This is not to say that the people of Grahamstown are not vocal in their their anger towards the ever-failing Makana Municipality, and issues of national importance. It is not uncommon to hear or see a protest on High Street where the townâ€™s people have congregated to highlight their anger at the all-too-familiar failings of the municipality, ward councillors and the ruling ANC in providing what was promised to the people. I would argue that Rhodes University students are living in a bubble of their own making, where we do not have to face the realities of the “real” Grahamstown around us – a Grahamstown where poverty, crime, gross human rights abuses and sexual violence against women and children are a painfully present reminder of what South African reality is like for many people. Weâ€™ve all told each other that we need to register to vote, because not to do so means that you canâ€™t complain when things are going badly. Weâ€™ve all encouraged each other to attend the successful IEC Voter Weekends in order to be properly active South African citizens. Some of us have scoffed at the rise of Julius Malemaâ€™s EFF because we think that his radicalism and populism are another failed attempt at staying relevant, and we all cringed and looked away at the disaster that was the short-lived â€˜mergerâ€™ of Agang and the DA. However, Rhodes University students have done very little when it comes to talking to each other about the realities of the upcoming elections and what needs to be realistically tackled by any party that wants our votes. Too often, we cling to the one-dimensional rhetoric that we keep hearing and seeing on radio and TV. Because of this, many Rhodes students are unsure of what to do with their vote because they donâ€™t know whatâ€™s going on in South African politics. As an almost born-free (I was born in 1992), I understand that, for many first-time voters, apartheid was not their immediate reality. Many of todayâ€™s youth have not been directly affected by the brutality of apartheid. They have not been exposed to the feeling of having their human dignity stripped away by a dictatorial regime hellbent on maintaining power, whatever the cost. One can argue that the 2014 elections should be more focused on the immediate and visible problems, like sexual violence on women, men and children, political and moral corruption, the failure of many municipalities to provide basic needs like electricity and water, and the complete lack of accountability to South Africaâ€™s people by governments both municipal and national. And yet, many of us do not have our own opinions on who to vote for, because we do not know what it is that we want to fight for.